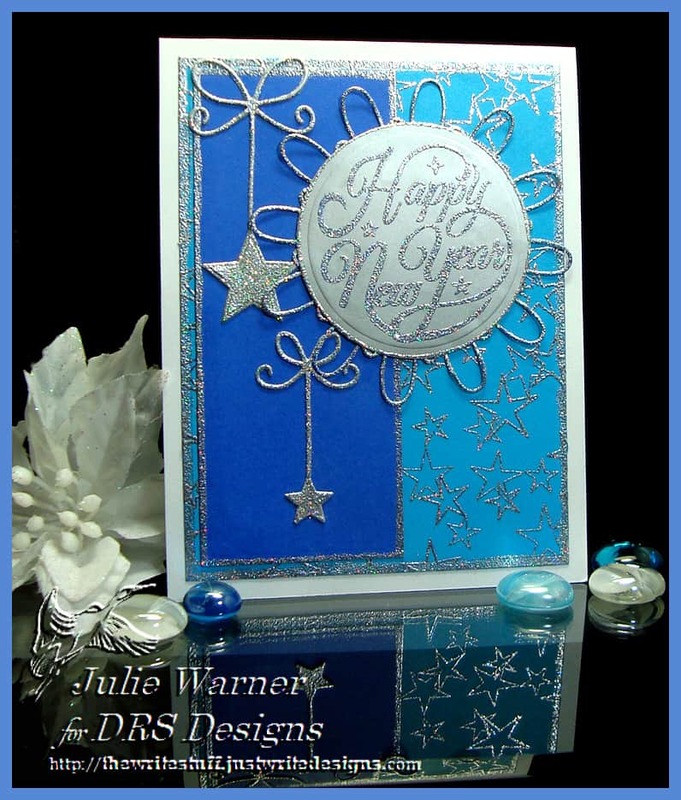 Today’s Sketch Challenge (SC625) is easy & seemed perfect for a New Year’s card. Also perfect if someone was late sending a Christmas card to someone else. 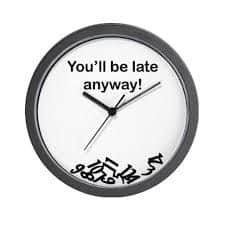 Not naming names…OK, it was me & this is my clock so it’s no wonder. 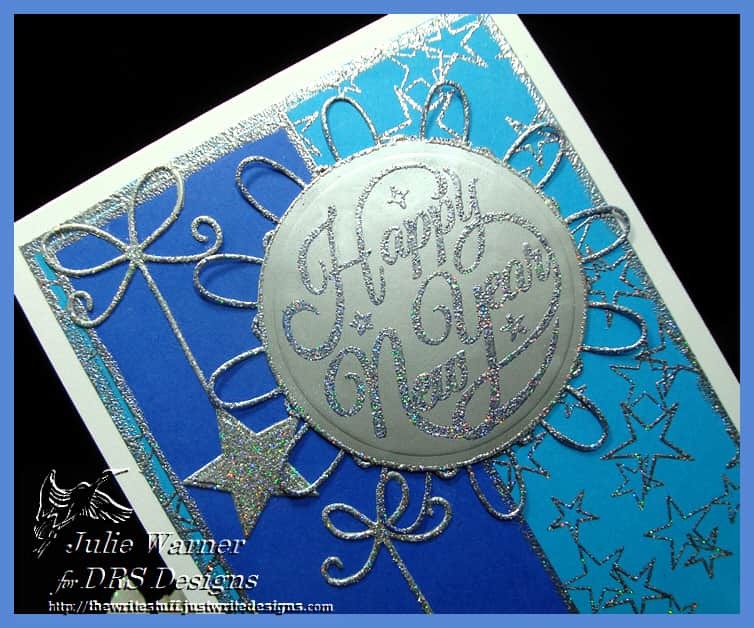 For my sparkly, starry card, I heat embossed the circle greeting onto a die cut silver metallic piece of card stock using silver ink and a sparkly silver embossing powder. 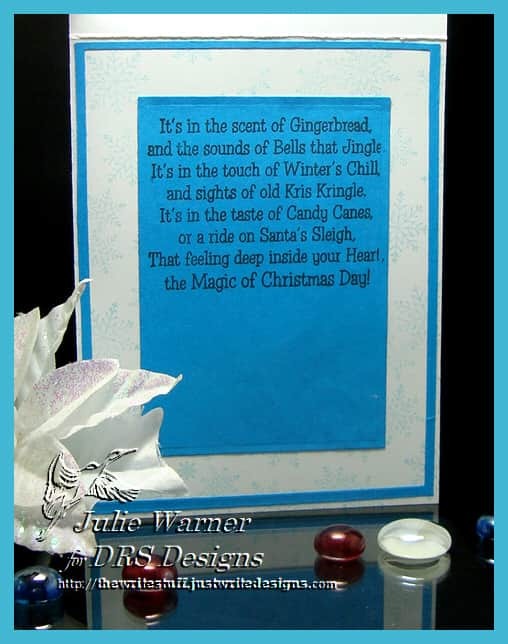 After die cutting the swirl behind it & the little stars, I coated them w/ the silver ink & embossed them w/ the same powder. 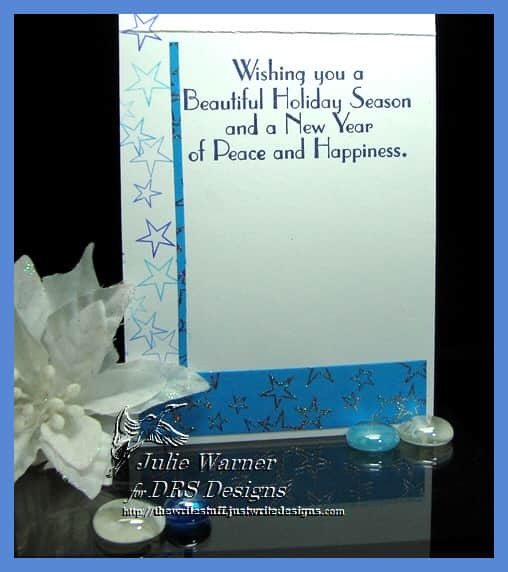 The two blue piece of card stock were die cut & I coated the edges & embossed them, as well. The sky blue piece also has the star bg heat embossed on top. Thanks so much for stopping by! Have a Happy New Year! 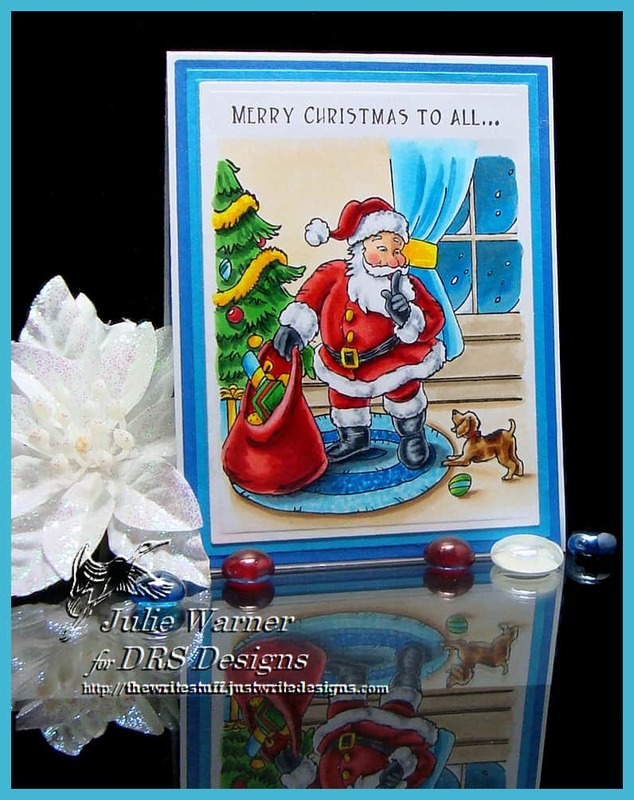 Today’s Free for All (F4A357) is to create a nighttime or night before card. This is definitely the Night Before…it’s night outside the window & Santa is delivering his presents. I’m also adding it to yesterday’s Ways to Use It..windows, since there is a window looking out. This is such a wonderful scene & it took me a while to color it all..then a really bad thing happened & ruined it. So I started all over. Don’t you hate it when that happens? 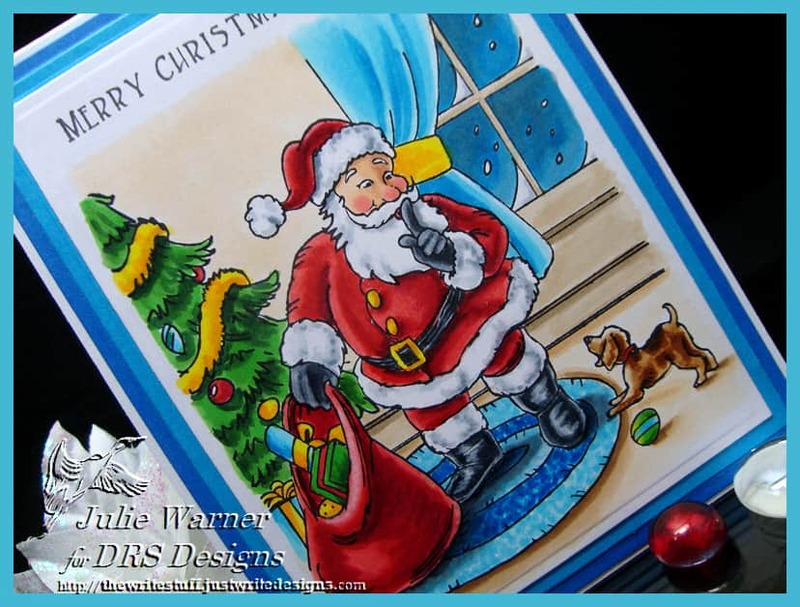 Since it’s pretty much a card covering scene, I stamped just the one line over the top & added two narrow layers. 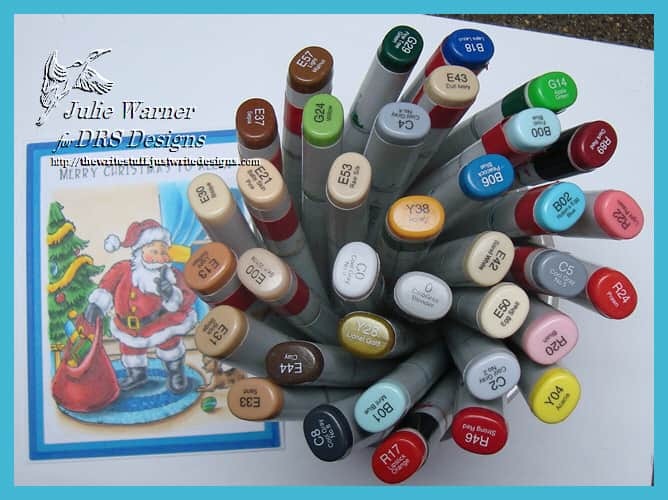 Below is a a look at the inside & underneath it are the Copics I used. Yep..a whole lotta colors going on here. Thanks so much for stopping by! Have a very Merry Christmas! 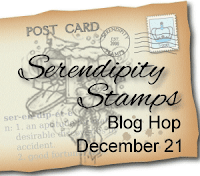 Welcome to the December Blog Hop for Serendipity Stamps! If you arrived here from Jeanne’s blog, you’re in the right place..if not, you may want to head over there first. The Prize – One $20 gift code will go to one random commenter from the blogs. So be sure to visit all the blogs because you don’t know which one the winner will be drawn from. You have through Sunday November 20 to leave comments on the blogs for a chance to win. Mary will announce a winner on November 21. The sale this time is 40% off the highest priced item in your cart use code “ 40fromhigh1216″ now through December 25. Each month a different image is 50% off. This month- it’s the Winter Doe! On the third Wednesday of every month., we’ll be celebrating with a Blog Hop! For another chance to win, be sure to play along with our monthly challenge. You can get all the details on the challenge HERE. I also made this for the Featured Stamper Challenge (FS516). I chose to case THIS card. 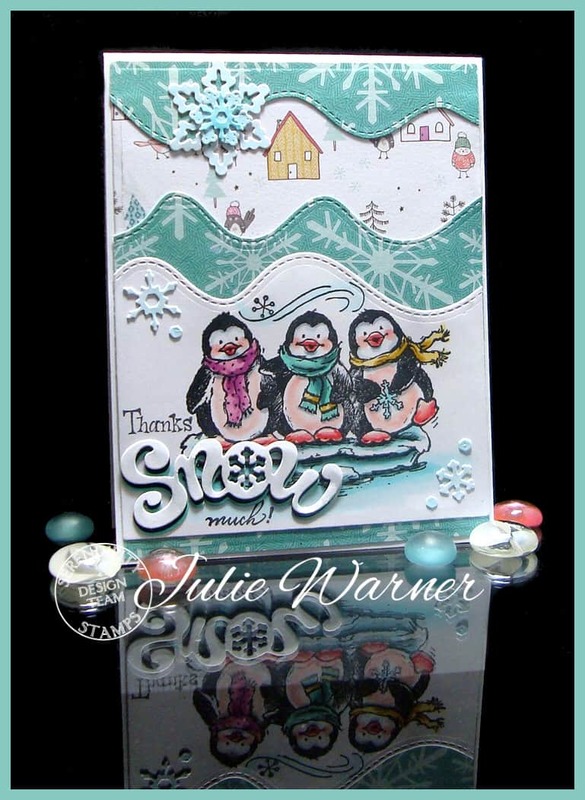 I kept the holiday theme and trio of penguins, but I used different images, different colors & a little different layout. Don’t you just love these adorable little penguins? They look so happy! I couldn’t wait to color them…and I love giving them rosy little cheeks and bellies. 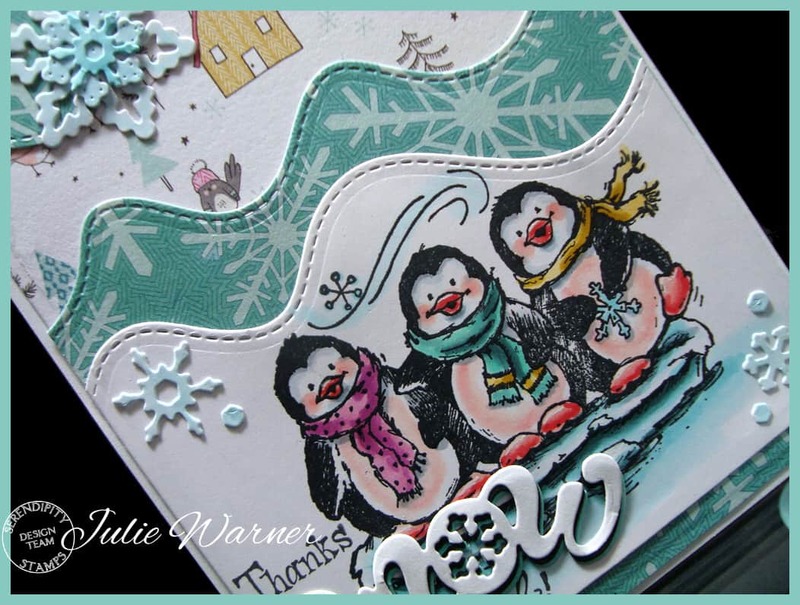 I put together parts of two greeting (the little Thanks fit much better in the space than the cursive thanks that comes w/ the Much part) and layered a die cut Snow to go between the two words. 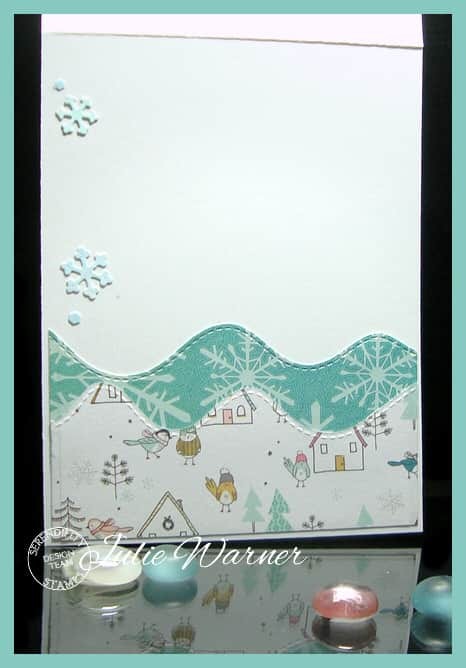 The snowflake designer paper was split to let the other paper show through & I added some snowflakes from the Snowflake Reverse die. I had every intention of adding some stickles or sparkly gems to the snowflakes, but just totally forgot. Here’s a look at the inside..I’ll add a greeting when I know who’ll be receiving it. Below it are the Copics I used. Please be sure to comment on all the DT Blogs..it will be so appreciated & also increase your chances of winning! 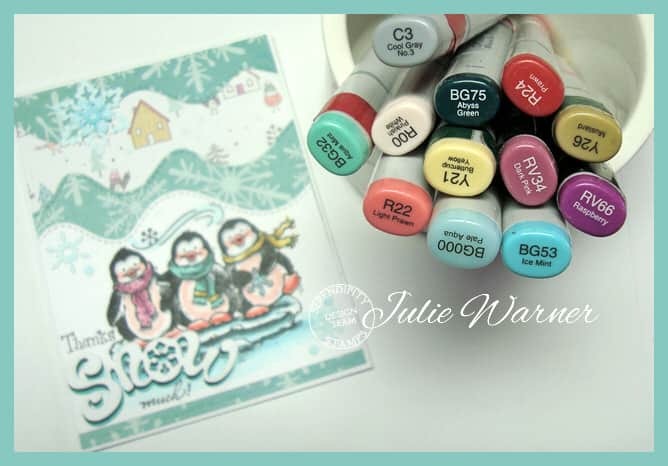 Stamps: Serendipity Stamps – Penguins, Thanks sm, Everyday Words sm.